This is definitely interesting. Under the theory that everything started with a “big bang”, Earth and all of its fellow planets are billions of years old. However, scientists say that it looks like Pluto is only 100 million years old, making it only 2% as old as Earth is supposedly. Pluto could have been created during the time of the Tyrannosaurus Rex. 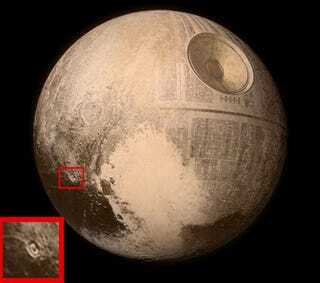 It is speculated that Pluto must have some sort of unknown heat source. Could this mean that Pluto could one day be an Earth colony? We at Icygeek can not help but think of the Marvel superhero Martinex, who was the last survivor of Earth’s colony on Pluto in the original [amazon text=Guardians of the Galaxy&asin=B00PSN1I7S]. It is rather exciting to think of the possibilities. Also, think of the possibilities when playing an RPG like [amazon text=GURPS&asin=1556347294] and [amazon text= d20 Modern&asin=0786928360]. Pluto is no longer just a blank space, but instead gives you something to work with. All that is required is one little spark (thank you Figment) to really make great stories. This entry was posted in News and tagged d20 Modern, GURPS, Pluto. ← Did Batman 1989 Hurt Superhero Movies?? ?